A new and exciting independent, art retail experience has arrived at Albert Dock Liverpool. Opening today, Dock Art is a pop-up shop that allows customers to watch local artists create works right in front of their eyes, before taking home a purchase or two, from traditional prints and one-off limited editions, to quirky items such as mugs, tea towels and bespoke t-shirts made from organic cotton. Located in Unit 16 on The Colonnades, close to Tate Liverpool, Dock Art is the latest independent to set up shop at Albert Dock, following the likes of Leather Satchel Co. and more recently, Utility. It is all part of the strategic reinvention of the retail and leisure offer of Albert Dock, led by the developer, Aberdeen Asset Management. “We launched our ambitious vision for Albert Dock earlier this year, after acquiring the commercial spaces in 2016. Albert Dock is a truly unique location, and it is our intention to enhance the already high quality local and national restaurant and retail brands here, with new, fiercely independent, and evolving brands. We want people to be excited when they visit the Dock – seeing and experiencing new things each time. 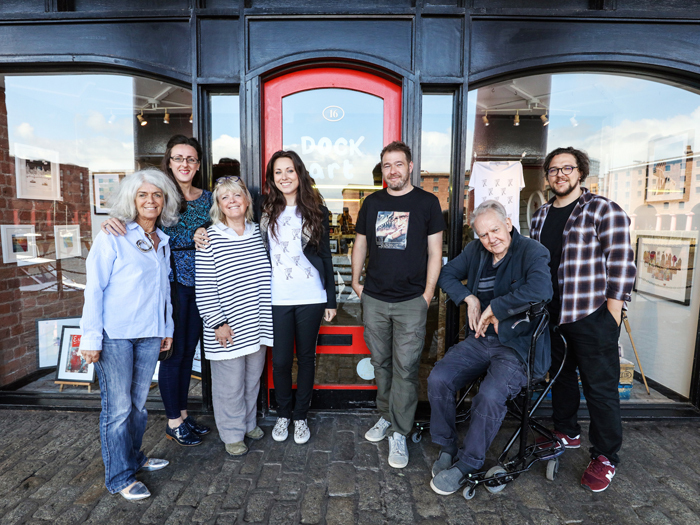 Co-founded by Katherine Caldwell and Freida McKitrick, Dock Art is the team’s latest venture, having run several pop-ups across the city centre in the last few years. But is it the Albert Dock location that is the icing on the cake for the business partners. Dock Art features works from 10 specially chosen, local artists, from illustrators and photographers, to a traditional letterpress printer. The pop-up is in response to the current high-street trend in creating unique, retail experiences for customers. Visitors to Dock Art will witness art being created first-hand, and the chance to hear the stories behind it from the creators themselves.